Check his previous season mark. The career marks took so long! I hesitate to admit that Ray Herbert made me laugh. I’m sure he’s quite sincere about his answer. I enjoyed the BR Bullpen feature about Herbert that began “A good pitcher who played for bad ballclubs during most of his Major League career…” How many careers are tales of being in the wrong place at the wrong time? I point out that Herbert’s two consecutive scoreless innings streaks of 1962-63 (lasting 31 and 38 innings, respectively) came late in his career. I got philosophical, wondering if he had undergone positive mental and physical changes with age. Herbert endured one of the biggest challenges I could imagine for a young player. In 1951, his first full season, he was yanked from the rotation after a 4-0 start! Not by Detroit manager Red Rolfe, but by Uncle Sam. The Army and the Korean War called. Although Herbert noted that he got to pitch some in the military, he offered two words when I asked how hard it was to come back after more than a year away. Herbert surprised me once more. He included his phone number. I haven’t included my phone number or e-mail to former players. I’m old-fashioned. I don’t think e-mail is for storytelling. Likewise, a phone conversation makes the listener a central part of the baseball tale. The story is only as good as the feedback or encouragement the listener gives. However, I’m eager to try a conversation. I’ve done my homework on Herbert (who owns seven lifetime homers as a pitcher in pre-DH days). Thanks to hobby buddy Rich Hanson’s input, I’m interested in hearing about White Sox personalities like Nellie Fox and Ted Kluszewski. Also, I wanted to hear how an 81-year-old views fan mail and autographs today, as opposed to during his 1950-66 playing career. 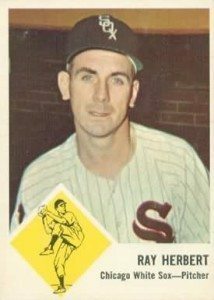 Readers: what would you like me to ask former pitcher (and Tigers batting practice hurler) Ray Herbert? I’ll call him next week and report back. So, did you give him a call? I’d love to hear how it turned out!